Stone makes a real, honest-to-God, session beer? Will wonders never cease! For the uninitiated (i.e. those of you who aren't British), the goal of a "session beer" is to allow you to consume multiple beers in one reasonably long session without overwhelming your senses or getting you completely sloshed. As such, these beers typically feature very low alcohol content, clean, balanced flavors, and an overall high drinkability. For some reason, the specifics of session beers are absurdly divisive in the beer nerd community. For example, just trying to pin down the ABV threshold after which a beer is no longer sessionable can be a laborious exercise. For the most part, though, people seem to agree that the beer should be no higher than 4-5% ABV. You'll see lots of arguments (usually from Americans) that a 5.5% or even 6% beer qualifies, usually accompanied by harsh denouncements (usually from Englishmen who claim that anything over 4% is an affront to the beer gods). There really isn't a single, definitive answer, and quite frankly, it seems like the history behind the phrase isn't even that well established (though the concept of a "session" has certainly been around for a while, the term itself seems to be a relatively recent development). Whatever the definition, these low-ABV, highly-quaffable beers are certainly a worthwhile pursuit. In case you can't tell, this whole concept grew out of British pub culture, and as such, sessionable beer is most common there. But there are certain circles in America that are also doing their best to promote session beers in the craft beer arena. Beer Nerd Details: 4.4% ABV bottled (12 oz.) Drank out of a, uh, glass that I don't know what to call on 8/20/11. 45 IBUs. 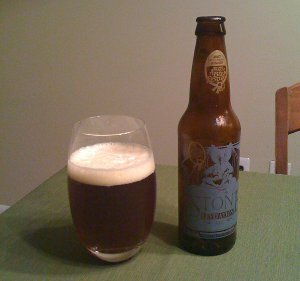 At this point, I don't actually have any Stone beers on my plate, but there are definitely some that I need to get around to (in particular, the decidedly non-sessionable Old Guardian Barleywine has been calling my name). This page contains a single entry by Mark published on August 30, 2011 9:01 PM. Trappistes Rochefort was the previous entry in this blog. Old Engine Oil is the next entry in this blog.